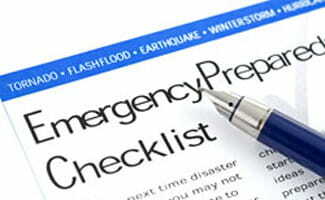 Disaster Preparedness Plan: Are You Ready for the 5 Most Serious Catastrophes? The summer season is a time for warmer weather, days spent outdoors and the threat of severe storms. From tornadoes to tropical storms, we have witnessed how dangerous summer weather can become. The top 3 severe weather threats of the summer season impacting the United States are thunderstorms, tornadoes and hurricanes. Knowing what to do in different situations and developing a disaster preparedness plan for your family and pets will help you reduce the impact of severe summer weather threats. Let’s look at the most common type of summer storms in the US, what to do if you’re stuck in the middle of one and how to be prepared. A tornado is a rotating, funnel-shaped cloud extending from a thunderstorm cloud to the ground. The rotating winds of a tornado can reach up to 300 miles per hour, and a cloud of debris usually indicates the location of a tornado, even if the funnel remains invisible. A tornado is one of the most dangerous storms you could ever encounter, because it can cause numerous fatalities in seconds and cause catastrophic damage. Visit our Tornado Safety article to learn what to do before, during and after a tornado. A thunderstorm is characterized by the presence of lightning and thunder, and it is usually accompanied by strong winds, heavy rain, sleet or hail. During intense storms, updrafts can reach up 100 mph, and downdraft wind speed can be higher. Lightning fatalities have decreased over the past few decades, but lightning continues to be one of the top three storm-related killers nationwide. Read our Thunderstorm Safety article for all the tips needed to stay safe. Hurricanes originate in the southern Atlantic Ocean, Caribbean Sea, Gulf of Mexico and eastern Pacific Ocean. They are a type of tropical cyclone or tropical storm and typically cause great damage to coastlines. Hurricane winds can surpass 155 miles per hour, and they sometimes produce tornadoes and storm surges. The heavy rainfall can also trigger landslides, mud slides or flash flooding. Our Hurricane Safety guide will provide all the steps you should take to prepare and recover from a hurricane. Natural disasters can have a devastating effect on your entire household. In addition to the damage caused by the actual storm, you might encounter some fire hazards present during and after a summer storm. Lightning and human errors are the main causes of a variety of these fire hazards, but you can reduce the chance of becoming a fire casualty by learning to identify these hazards and how to avoid them with our Fire Safety Tips. You may experience many types of severe weather and other natural disasters during your lifetime. Being prepared for these emergencies requires knowledge of specific types of hazards, as well as how to prepare for and recover from them. Because we all spend our days in different environments, our decisions and the actions we take to protect ourselves may change from day-to-day. The first steps to being prepared include assembling an emergency supply kit and developing a family disaster preparedness plan. Read all of our recommended steps at our Emergency Evacuation Plan.